In China, there is a long history of drop forging, it is a continuation of the manual workshop production way. Perhaps at the beginning of the 20th century, with the invasion of the imperialist powers and the qing dynasty's westernization movement, it gradually appears in machinery industrial production mode in railway, armaments factories, shipbuilding and other industries. The main sign of this shift is using the powerful forging capacity machines. In the 1950s, we can steel see steam hammer, electric pneumatic hammer, steam pressure hydraulic press made in English, Japanese, German and other countries working in the factory of China. In 1967, the first machinery industry ministry presided the nationwide "drop forging industry technology symposium", at the meeting first time speaking and recommended many European and American technology and equipments, and each of the participants get a beautifully printed, injustice to develop the foreign forging equipment atlas and visited the research progress in military colleges and universities. 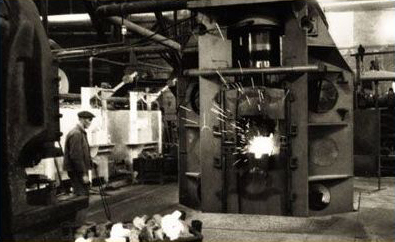 Despite the "cultural revolution" has already begun, people'pursuing the spirit of science and technology progress has not been fully beat, the drop forging industry was still improving in the 70 s, such as to produce the double column drop-down type hydraulic press, hydraulic die forging hammer, etc. It is a pity that these equipments did not play a much role in production, gradually withdrawn. In the 80s,after the implementation of the "reform and opening up" in our country, from quality to quantity, drop forging industry has a new development of comprehensive. Chinese modern drop forging industry is based on years in 1960 and 1970. Old drop forging equipments are still exsited and the vast majority are still running, subject to reasonable renovation or endure pain. After the 80s, people purchased a lot of new drop forging machinery and production lines from advanced countries, but excessive investment, capacity, redundant construction, poor management, low profit, and other historic defects also are faintly visible, need high-level decision makers to handle calmly. After decades of development, especially the government "five-year", the implementation of the ninth five-year period of science and technology development plan of the key research task, the drop forging got a new stage in China, gratifying achievements are made in the enhanced capacity for independent development, energy saving, accelerated development of precision forming, etc. Nowadays in the 21st century, with more and more homemade drop forging equipments enter into drop forging factories, we are now could make finished drop forgings with tighter tolerances in next shape. Meanwhile, like Fly Forge, we also have machining capacility to serve our customers in all sides. So more and more foreign come to China to purchase drop forgings for our low price, good services and high quality.